This is the final book of the Crossfire series and we will get to see what happens to Eva and Gideon. They have been through everything imaginable but this story will see them through the last of their troubles. They still have a lot of things that they are working on as individuals but they seem to be strongest when they are together. They are the type of love story that we love to read and we hope that Day will end their story with the best Happy Ever After. What I am most excited about this book is that I will get to see if the extra three books was worth it. Much like The Mortal Instruments (where it began as trilogy but later became a 6-book series), it felt repetitive at parts, but when it came to the last book, I found that I was glad that there was three more books. There are a lot of questions that were left blank and with the extra three books, most if not all those questions where answered. Hopefully Day does that with this book it will be like that. You can buy the book on Amazon , Barnes and Noble , Kobo, and other major retailers. Are you going to buy One With You? 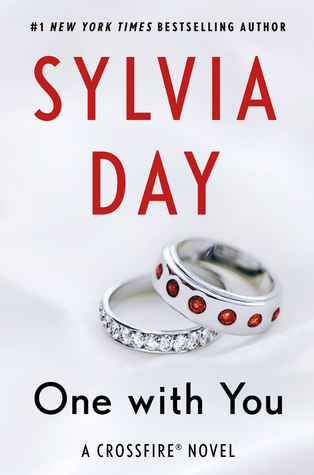 This entry was posted in Books and tagged Crossfire series, One With You, Sylvia Day.